No guide to running in London would be complete without a thorough going over of Hyde Park and its almost seamlessly conjoined neighbour Kensington Gardens. The Serpentine in winter. Photo: Indusfoto (Royal Parks). With Kensington Gardens in the west and Hyde Park in the east, they are separated only by West Carriage Drive, which runs north-south across this otherwise roughly rectangular parkland. Most runners will incorporate portions of both parks into their run and a full loop around the perimeter of the entire area is 4.3mi (7.0km). 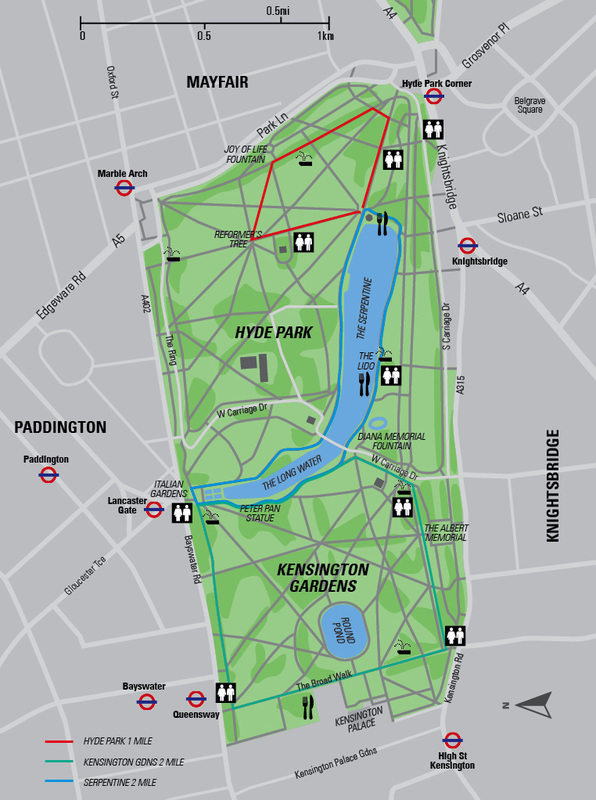 Hyde Park | A perimeter of Hyde Park, following the trails closest to the fence line, is 3mi (4.8km). The park is packed full of trails, most of which are sealed. Construct your own favourite loops through formal gardens (in the southeast), grass fields, semi-woodlands, and of course around the Serpentine. The Serpentine provides the perfect spot for 2mi loops or tempos. It’s 100m longer than 2mi, but if you start from the cafe at the far eastern end of the lake (at the southern most point of the cafe’s seating area) then run clockwise around the lake (keeping close to the shore except when you go around the Italian Gardens), and then finish as soon as you meet the cafe again, that’s 2mi exactly. See below for the Mapmyrun map and leader board. If the Serpentine is too busy, try a 1mi loop that starts just on the other side of Serpentine Road from the cafe. Run in an anti-clockwise direction past the bandstand, then turn left just before you meet The Broad Walk, using the final shortcut through to The Broadwalk. Follow this main path north until you pass the Joy of Life Fountain (on your right), make a gentle left here to cross the grass field to the Reformers Tree junction of paths. Turn left to run back to the start. This loop involves a 10m rise and fall and a full loop is about 20m longer than a mile. Kensington Gardens | This is the more developed of the two parks, with plenty of landscaped symmetry, formal gardens and statues. Like Hyde Park, most of the paths (of which there are many again) are sealed but there are also some nice grass trails in the interior. A full perimeter loop of the gardens is 2.7mi (4.3km). 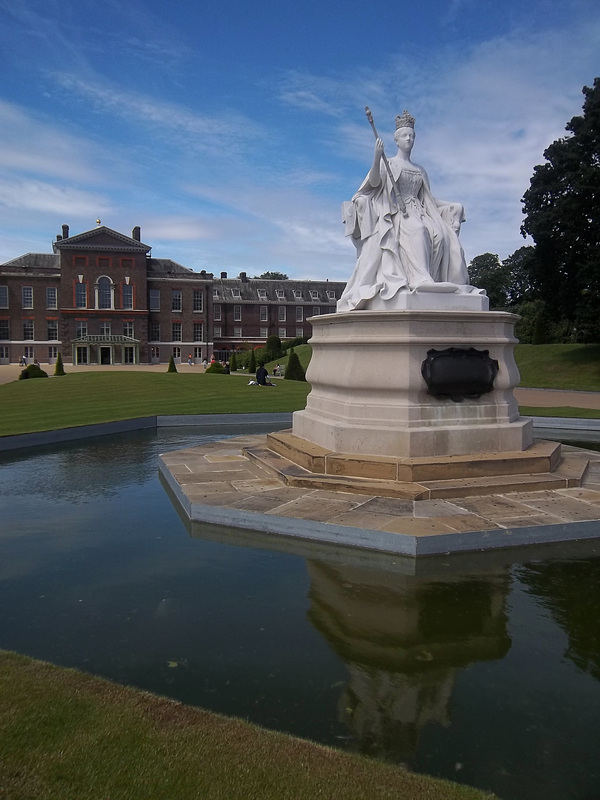 A great 2mi loop starts from the Palace Gate (on Kensington Rd, south side of the park) and heads north along the Broad Walk past Kensington Palace. Just before you exit the park at Bayswater Road, turn right on to North Walk to reach the Italian Gardens. Turn right here to follow the water’s edge south (on the west bank), but instead of going under the bridge into Hyde Park, turn right to follow the trail running parallel to West Carriage Drive. At the Mount Gate, turn right again onto the straight path heading to the Board Walk. The 2mi point is actually 100m before you reach the start point. Options | Holland Park is a great nearby add-on. It’s about 1km west by either following Bayswater Road (north Kensington Gardens) or Kensington High Street (south Kensington Gardens). By using Holland Walk in the east and then looping back through the western side of the park itself, you’ll complete a loop of about 1.7mi (2.7km). Finally, be sure to run the way-marked Diana Memorial Walk that charts a wonderful course through both parks as well as neighbouring St James’s and Green Parks. Also, from the Italian Gardens, it’s less than a mile north, past Paddington Station, to Little Venice from where you can run either east or west along the canal. Surface: Sealed (with grass options and even a bridle trail). Traffic Warnings: This place gets very busy! Times: Kensington Gardens is open from 6am to dusk and Hyde Park 5am to midnight. Toilets: Each of Kensington Gardens’ four corners has a toilet, and in Hyde Park the Lido, Rose Gardens and south of the Reformer’s Tree. Rail: Hyde Park Tube Station (Piccabilly line; SE corner of the parks); Marble Arch Tube Station (Central line; NE corner); Lancaster Gate Tube Station (Central line; near Italian Gardens); & Queensway Tube Station (Central line; NW corner). Bus: 2, 9, 10, 14, 16, 19, 22, 36, 49, 52, 70, 73, 74, 82, 94, 137, 148, 274, 360, 390, 414, 436, & 452. Thumbs Up: It is hard to imagine two inner city parks that could match these beauties. Thumbs Down: Events and summer foot traffic can often render large sections of the parks non-runnable.